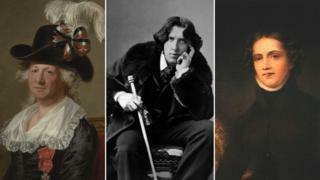 Oscar Wilde's former home, the estate of "the first modern lesbian" and a memorial to a trans spy have been given special status by Historic England. Six "historic LGBT venues" landmarks are being recognised for reflecting England's "queer history". Chief executive Duncan Wilson said the influence of men and women "who helped build our nation has been ignored" because they came from minority groups. The sites include the former home of Benjamin Britten and his partner. The initiative comes in the run-up to the 50th anniversary of the partial decriminalisation of homosexuality in 1967. Playwright Oscar Wilde's west London home already had listed status, but has been relisted to emphasise its importance as an LGBT landmark. The Irishman lived in Kensington and Chelsea before being imprisoned for two years' hard labour in Reading Gaol for gross indecency. Burdett-Coutts Memorial at St Pancras Gardens in north London, which commemorates people including the 18th Century trans French diplomat and spy Chevalier d'Eon, has been upgraded to Grade II*. Chevalier d'Eon identified as a man for 49 years, but after infiltrating the Empress of Russia's court by dressing as a woman the spy lived the rest of his life as female. Mr Wilson added: "Our project is one step on the road to better understanding just what a diverse nation we are, and have been for many centuries. At a time when historic LGBT venues are under particular threat, this is an important step." Last year the body listed the Royal Vauxhall Tavern - a well-known LGBT venue - which prevented the club's development by its landlord. Image caption St Ann's Court in Chertsey, Surrey, is hailed as an example of "queer architecture"
One of the previously-listed homes to be given special status is St Ann's Court in Chertsey, Surrey. Owned by architect Christopher Tunnard and broker GL Schlesinger while homosexuality was still illegal, the master bedroom of the house could be separated if visitors came round. The estate of "the first modern lesbian", Anne Lister, has been relisted to record her importance as a lesbian pioneer. At Shibden Hall, she wrote a coded diary, using the Greek alphabet and mathematical symbols, which would describe her lesbian affairs. The home of post-war composer Benjamin Britten has also been relisted, to highlight his relationship with professional and personal partner Peter Pears. The celebrated conductor and writer of War Requiem spent most of his life in Red House, Aldeburgh, where he founded the annual classical festival in 1948. Historic England has also been compiling people's personal monuments to the LGBT community in an online research project called Pride of Place. More than 1,600 contributions have been made to the project, spanning the length and breadth of the country. Lead researcher Prof Alison Oram said: "Queer heritage is everywhere, and we hope that Pride of Place will lead to more historic places being publicly valued and protected for their important queer histories."